Bank of America has today introduced the ability to make ATM withdrawals with Apple Pay, Cult of Mac is reporting. Apple Pay users however need to locate ATMs which are kitted out with an NFC reader and display an Apple Pay logo. 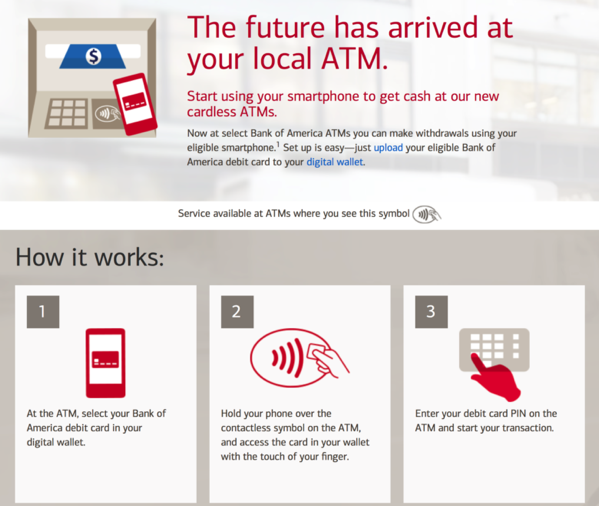 To use the feature, users must select the Bank of America debit card in their digital wallet, then hold their iPhone over the contactless symbol on the ATM and enter their debit card pin to withdraw money. According to Bank of America, currently Consumer Debit Cards, US Trust Debit Cards and Small Business Debit Cards (owner card only) are supported by the service. The ability to deposit funds however is not yet available. The source highlights that the Apple Pay ATM withdrawal feature only works with Bank of America cards, while other bank cards will receive an error message, even when using a compatible ATM. Earlier this year, both Chase and Wells Fargo announced plans to offer similar services but are yet to officially launch them. With 5 of Canada’s major banks already supporting Apple Pay, we see the ATM withdrawal feature coming to Canada pretty soon as well.